I started doing stand up comedy 15 years ago, back when I only had one children. I supported Arj Barker, went to the Melbourne International Comedy Festival, had loads of fun and got away with perving at a lot of good looking men from the stage. Then I embarked on a more extensive breeding program so I gave up stand up for a few years because I was so sleep deprived nothing was funny. Back when I was performing comedy regularly, a fabulous, strong, feminist lady artist called Pam constantly baby sat for me and ensured that my daughter had a magical time at Pam’s house drawing and painting and visiting art galleries. My teenaged daughter is now an artist because of the love and care and help Pam gave her when she was very small. 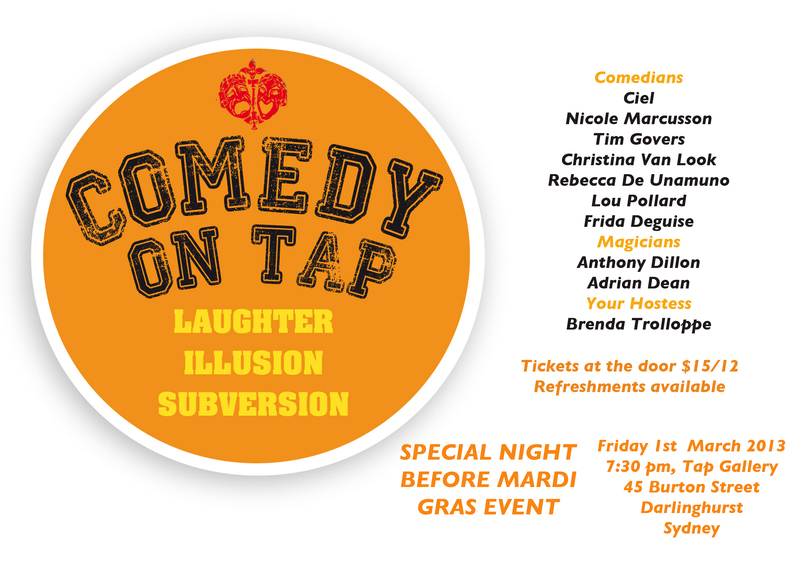 I’m back doing stand up and I’m putting on a comedy night once a month with good friends at a gallery in Sydney. Pam died this week in a terrible accident and our first comedy night is the night before her funeral. I don’t know how I’m going to be funny in the face of losing my friend. I’ll be looking out into the audience and hoping she’ll be there because she really helped me to follow my dream. Thank you Pammy. You are so brave in so many ways & your friend will be there to strengthen you (& make you funny). Best of fun & I may just pop in as literally around the corner from me. Well that was a shock. Call me 0413 460 525.